It's October again and as the foliage turns orange and the cheap candy lines the store shelves, it's a good time to catch up on some horror movies. So, in the spirit of the old October Horror Movie Challenge, in which one tries to watch a previously unseen horror movie each day of the month, I'm going to attempt to provide 31 reviews for similarly unseen horror movies throughout October. For our fifth outing, we settle in for an old-fashioned tale of terror with a distinguished cast. Stoke up the fire and grab a glass of wine as we spin a Ghost Story. Here's another one I've been meaning to get to for a long time. Based on the actors involved and what little I had heard, I had already formed an assumption about what type of film it was: the very kind of slow-burn, old-fashioned, classy chiller I adore. While Ghost Story may not fit that description exactly, it throws considerable effort into creating a spooky atmosphere and emerges as a handsome if somewhat lurid shocker. 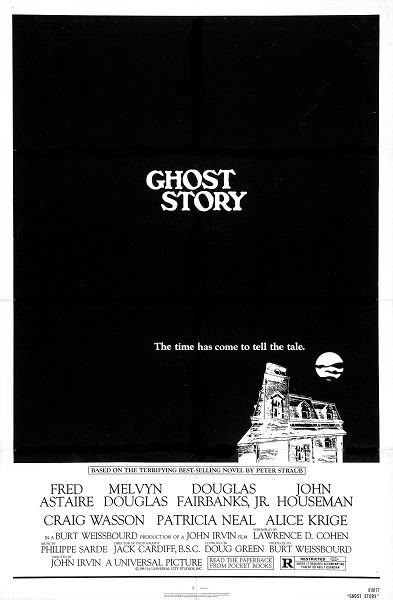 The film, based on the novel by Peter Straub, begins appropriately enough with someone performing a creepy story, made all the more effective because it's John Houseman doing the telling. He's one of a quartet of elderly friends (the others are played by Melvyn Douglas, Fred Astaire and Douglas Fairbanks Jr.) that comprise the Chowder Society, who exchange scary tales to pass the time in their sleepy Vermont town. But another tale is unfolding as David (Craig Wasson), son of the town's mayor (Douglas), returns home following the allegedly accidental death of his twin brother (moustached Wasson). David is convinced it wasn't an accident and that the truth behind it somehow involves a eerily beautiful woman (Alice Krige) that both brothers became involved with. As the society's members are tormented by nightmares and besieged by visions of a gruesomely decayed girl, he comes to believe his phantom is somehow tied to theirs and joins their ranks to discover the origin of their common tormentor. Any illusion I had that this would be a more subtle form of scare-show evaporated in the first fifteen minutes when moustached Wasson takes a naked blue-screen swan dive out the window of a building, a scene so visually bizarre and disjointed I spent the next twenty minutes thinking it was supposed to be a dream sequence. From there we get many moments of gooey spectral figures jumping out at the main cast and flashbacks to the bizarre, intense courtship between Wasson and Krige, who seems contractually obligated to only play beautiful but spooky femme fatales. Happily, she does it well and gives the film's paranormal antagonist a disturbingly seductive quality, delicately cooing to her terrified victims about what she has in store for them. The script by Straub and Lawrence Cohen holds back much of the story until the midpoint, which is admirably intriguing but means that a lot of the characters' behavior seems strangely overwrought when viewed without the context of their backstories, particularly David's vigorous conviction that his brother died an unnatural death. The situation isn't helped by some downright goofy story elements, such as two escaped mental patients determined to help carry out the malevolent spirit's plan. The story really begins to click when we begin to pierce the secrets that the society itself has kept for fifty years and the elder cast members take the stage. Astaire is particularly good as Ricky, striking up a warm but solemn friendship with David and hinting at the toll years of remorse and regret have taken. Douglas, who had been dealing with other cinematic ghostly horrors not long before, also evokes our sympathy as the physician broken both physically and emotionally. Houseman's in fine form as the prickly natural leader of the group and his opening story sets the mood nicely, a trick he'd pull off again in John Carpenter's The Fog. Alas, Douglas doesn't get as much screentime to impress as David's chilly father. Director John Irvin gives the film a soft, picturesque look enhanced by some gorgeously scenic Albert Whitlock matte paintings. While some of the shock moments feel a bit clunky, he also comes through with a few compelling visuals, such as Krige's blurry figure chuckling beside the scene of an accident or Houseman's visually inventive encounter with a spectre on a snowy road. The finished product may not have the elegance of The Haunting or The Innocents, but it's pretty to look at and the main cast embue the proceedings a greater weight and dignity than it might otherwise possess. Trivia tidbit: Watch for a quick appearance by a rotted, skeletal hand in the finale of the film. The grotesque limb had originally been built for Griffin Dunne's final decayed appearance in An American Werewolf in London but went unused there.